"Best Ocean View in All Playa del Carmen"
At your arrival, you will appreciate the intricate details in design, from the Asian-inspired elements to the impressive, hand-carved, wooden doors at the entryway to each suite. The atmosphere of this unique, luxury development exudes sophistication in an inviting, serene setting. 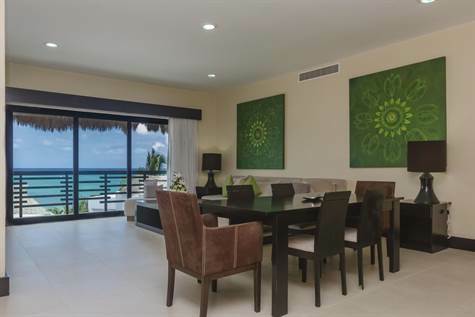 This amazing Ocean Front For Sale Condo at Playa del Carmen suite 305 features breathtaking ocean views from the living area and main bedroom, a fully-appointed kitchen, a deep soaker tub with rain shower head, marble throughout. In the master bedroom, are a four-post bed, plasma TV and safe. The second bedroom, also with its own flat screen TV, accommodates four comfortably. Follow the staircase up to your exclusive roof top terrace, THE BEST OCEAN VIEW TO MAMITAS BEACH, they are in store for a stimulation of the senses beyond compare. From this vantage point, can be enjoyed a mesmerizing, 180 degree view of the turquoise-colored Caribbean Sea, the warmth of the cheerful, Mexican sun and the taste and aroma of the salty, tropical breeze. Off to the side of the space is a private pool and lounge area. A dining table and chairs for eight is a perfect location from which to watch a magnificent sunrise or to sip on a cocktail with family and friends. Aldea Thai is situated between one of the world’s most popular, white-sand beaches and the famous 5th Avenue. Within walking distance are a limitless array of restaurants, beach clubs, brand name stores, local artisan shops, gyms, yoga studios, dive centers, tour agencies, night clubs and spas. Amenities on the premises include valet parking, a glistening pool showcasing Thai-Balinese sculptures and a beverage and snack bar. Also available are child-minding, in-room massage, laundry and dry cleaning services. This premium PH for sale at Playa del Carmen is the best located unit in the complex, If you are looking for FULL OCEAN VIEWS From you living area, kitchen, master bedroom and of course from your private Roof terrace, at the hottest location in Town, It does not get better than this. This luxurious piece of Real Estate is only for the few.